Support AV output, TV Out NTSC/PAL with for HDMI Slot.Video Resolution: 1920*1080P FULL HD/15fps,1280*720/30fps,640*480.AV Output: TV Out: NTSC/PAL with for HDMI slot. Sensor: 5MP CMOS sensor, Max 24MP Interpolation.File Format: Photo: JPEG; Video: AVI; Audio: WAV.Exposure Control: Auto;Exposure compensation:¡À2.0EV.White Balance: Auto/Daylight/Cloudy/Fluor H/Tungsten. 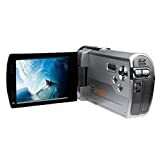 3.0 LCD Touch Screen Digital Video Camera of 16¡Á Digital Zoom, It Come with a Remote Control and A 1/4″ screw hole to fit your various shooting needs. NOTE:The charger and memory card are not included. This entry was posted in Discount Photography and tagged 1080p, 24MP, Camcorder, Camera, Digital, Full, H2X3, Lacaca, Screen, Touch, Video, Zoom by Ball Photo. Bookmark the permalink.